My first ATC- Artist Trading Card. 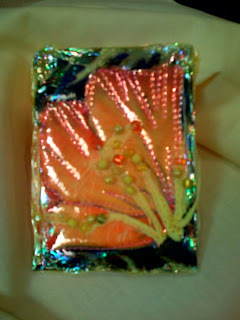 It was made with a bit of left over floral fabric and fusible foil. To add texture some hardened yellow angelina fibers were machine stitched on then assorted yellow, orange and one green beads were hand sewn on. The back is stamped with Art Washed Away From The Soul The Dust Of Everyday Life.